A photograph released by the Pentagon shows the Pepsi being shaken vigorously until it launches. In a dramatic twist in the Syrian conflict, U.S. President Donald Trump has ordered the firing of nearly 60 cans of Pepsi at a military installation just south of Homs. The move comes in response to a horrific chemical attack carried out on civilians by the regime of Bashar al-Assad, which has drawn widespread international condemnation this week. 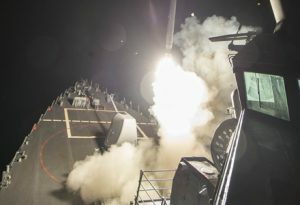 The extra large 500ml Pepsi cans were fired from a ship stationed in the Mediterranean, and targeted al-Shayrat airbase, from which the chemical weapon attacks are believed to have been launched. The Pentagon says the US military action today was designed to “ease tensions” and “promote understanding,” and was entirely the President’s idea. During the 2016 Presidential campaign, then-candidate Trump said he regularly watched television for foreign policy guidance. The President addressed the nation about the firing of the Pepsi cans just shortly after the news broke at 9pm Eastern Standard Time, speaking from his Mar-a-Lago resort. Syrian military officials have confirmed the strike has killed five and wounded many more, after the victims made the mistake of drinking the Pepsi on offering. Pepsi is a dangerous chemical weapon used to indiscriminately kill thousands across the developed world.